Made by SPOSN, genuine and original. One of the most popular modular systems in Russian special forces. This system is not Molle! 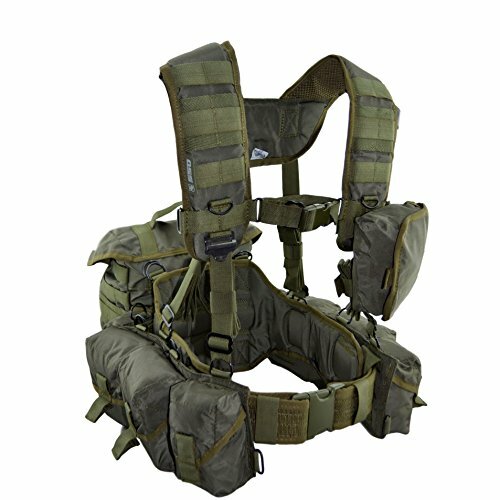 1 x Base vest (soft belt, rs-31 belt, shoulder straps harness). 2 x Pouches that allows to hold up to 12 AK Mags, 4 Hand Grenades and 4 Flares. 2 x Pouches that allows to hold up to 8 RPK Mags, 4 Hand Grenades and 4 Flares. 2 x Pouches that allows to hold up to 8 SVD Mags and 4 Hand Grenades. Universal size (from 40 till 64). Reliable, time-tested manufacturer. Used in Russian special forces. One of the most popular modular systems in Russia.